If you guessed "Those aren't Oreo's?!" You're close, but it goes deeper than that. Hydrox never did it for me. Maybe the disingenuous brand "Sunshine" didn't match my pragmatic style as a 7 year-old and National Biscuit Company (Nabisco) did. I thought maybe Oreo got there first and this seemed like a cheap copy never matching the standard set by the original. 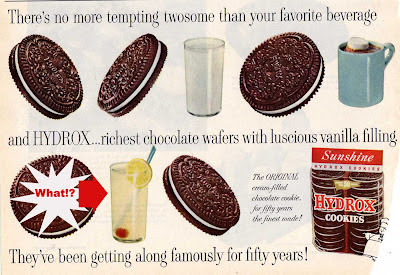 Actually, Hydrox beat Oreo to the store shelves by 4 years coming out in 1908. Hydrox had a different recipe that made the creme a little tangier and cookie a little more dense, the idea being it would stand up better to dunking. However, I feel this was a fatal design flaw because no matter what cookie you are dunking, where's the fun if there's no danger in losing the whole thing to the bottom of the glass? The real error in this ad this ad is the suggestion that you should dunk your Hydrox in a Lemonade? Really!? 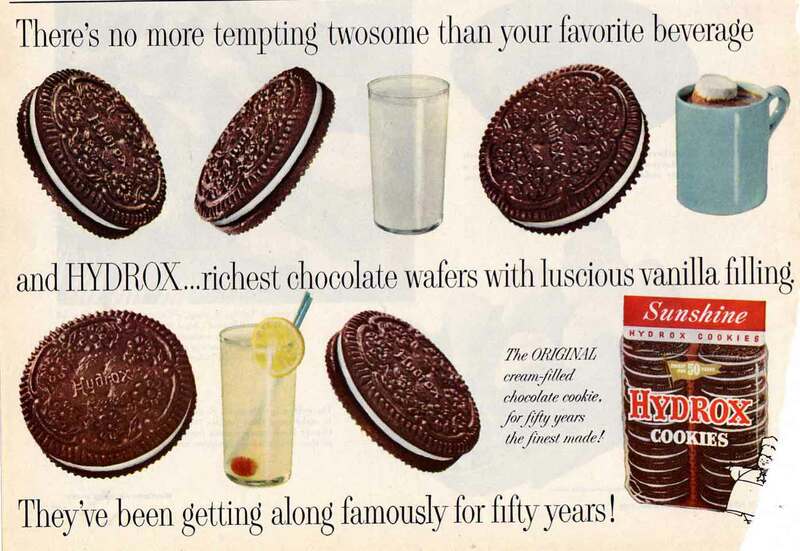 The Hydrox brand was sold to Keebler in 1996 and then again to Kellogg some years later. Though the cookie seemed to be crumbled for the last time it was brought back for it's anniversary in 2008. Gone for good? A version of the cookie is still produced under the Famous Amos brand...if you need to get your fix. Carvel claims to use the crumbled cookie in their ice cream cakes, but I have never had the patience to re-assemble one from all the tiny pieces to find out. Even if I did, I can't see eating it with a tall cool lemonade. The fact they're pairing it with what appears to be a martini in a hiball glass? I always thought they were great.